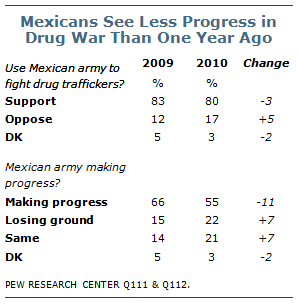 A survey of Mexico by the Pew Research Center’s Global Attitudes Project, conducted April 14-May 6, also finds continuing support for American involvement in the battle against drug cartels — at least in terms of training and financial support.1 Fully 78% favor the U.S. providing training to Mexican police and military personnel, unchanged from the 2009 poll. 1. In order to assess the impact of the recently passed Arizona immigration law on Mexican views of the U.S., 800 interviews were conducted in Mexico from April 14-20 (before the bill was signed into law by Arizona Gov. Jan Brewer on April 23) and 500 from May 1-6. The survey of Mexico was part of the Spring 2010 Pew Global Attitudes survey, which included 22 nations. For more findings, see “Obama More Popular Abroad Than at Home, Global Image of U.S. Continues to Benefit,” released June 17, 2010. Most Mexicans See Better Life in U.S.